October is the time of year in Scotland to harvest potatoes. Traditionally entire families participated in this activity, and children were excused from school. From this the 'tattie holidays' became a feature of the school year. This continues as the October mid-term holiday, which seems a rather boring name by comparison! The word tattie is obviously derived from potato. To howk is a verb which means to dig or dig out. 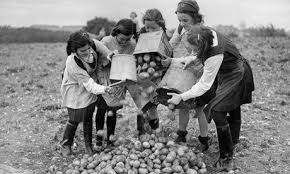 The photo shows a group of school children tattie howkers from a few years ago!